With utilizing advanced technique, Cloud Service runs on a shared structure platform with a large number of server groups. It supports unlimited expansion which can cooperate with massive, advanced equipments that add in the future. Cloud computing automatically divides a huge computing process program into numerous sub-programs through network, and then sends result which is searched and computed by a mighty system of several servers to users. The situation is similar to a factory divides works into details, and then processed by a group of staffs which can enhance the efficiency of process. The operation principle of Cloud service is separating the operation and storage of web service into two huge server areas. If one of the server or storage is broken down, website and email will automatically connect to other server which make the service will not be affected by the failure of server's hardware. In tradition, it is necessary to shut down the server before updating the server hardware. This will affect the normal operation of the web and email service. However, since Cloud computing supports the function of unlimited expansion, by using this technology, we no longer need to shut down the server when updating the hardware. It allows future expansion or hardware updating to become more elastic. In Cloud Hosting, information is dispersed to every hard disk and they read simultaneously which speedups the rate and strengths the restoration ability when the hard disk is down. 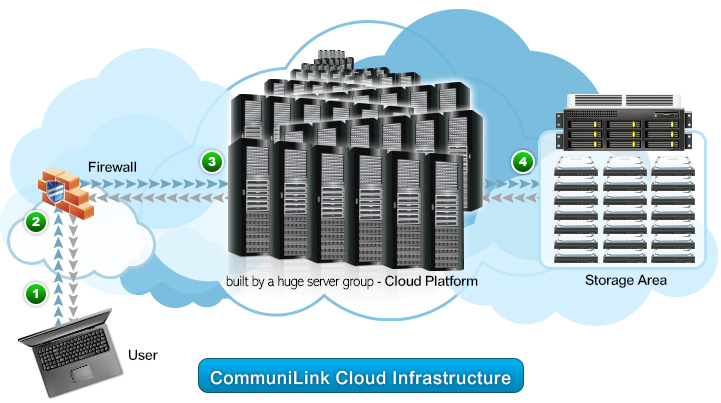 CommuniLink provides non-stop premium hosting service to customers through RAID technique where mirroring and striping data and then store them in several storage areas. Cloud hosting platform supports the unlimited expansion of hardware, which let us to prepare an environment for the increasing demand of expansion. Why Cloud Hosting is better than the Traditional Hosting service? CommuniLink owns two exclusive fiber optics networks over 20Gbps bandwidth; as a result our customers are privileged to have connectivity protection and stable online market network. Basic facilities include: Cisco fiber router, Juniper SRX 10GE firewall,providing you a safe and security network. Could hosting stores and processes the operation of website and email in a cloud platform that formed by a huge server group Through this technique, it can process ten million even billion of information in few seconds which is as mighty as Super Computer's network service; therefore, the speed is faster than traditional hosting. The operation principle of Cloud service is separating the operation and storage of web service into two huge server areas. If one of the server or storage is broken down, website and email will automatically connect to other server which make the service will not be affected by the failure of server's hardware. In addition, Cloud computing supports the function of unlimited expansion, providing a flexible, stable and safer environment for the hosting service.